The book has been conceptualized to bring out the relevance of the UN Declaration on the Rights of Indigenous Peoples through an analysis of various thematic and geographical areas and case studies. It is written by alumni of the international Summer Program on Indigenous Peoples’ Rights and Policy that has been held at Columbia from 2013-2017. Its vision is to make the University a cultural bridge of the world, through strengthening leadership and research in human rights and social justice. 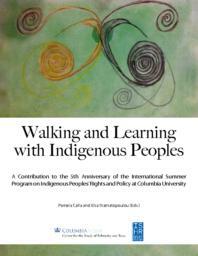 The International Summer Program on Indigenous Peoples’ Rights and Policy at Columbia is one of those avenues. This edited volume is devoted to the Fifth Anniversary of the Summer Program. We believe that it is impossible to study the world without including Indigenous Peoples' political practices, cultures, ways of knowing, aspirations and their global movement. It is also incongruous to ignore that Indigenous Peoples are literally changing the face of contemporary politics in every continent and have been and are continuously producing valuable knowledge for both the benefit of Indigenous Peoples and the well being of our entire planet. The book includes articles on “Law and the Literary: A Narrative Approach to the United Nations Declaration on the Rights of Indigenous Peoples”, by Keira Anderson; Theresa Castillo’s on “Decolonizing health policy: an evidence based conceptual framework for addressing the right to health for Asian Indigenous women”; on “Traditional Tribe or Corporate Entity? The Influence of Treaty of Waitangi Settlements on Tribal Groups in New Zealand”, by Melissa Derby; Vida Foubister’s “The Sixties Scoop: Canada’s Legacy of Lost Children”; “Himalayan Indigenous Peoples in Local Election after 20 years: The Historical Gendered Perspective from Dolpo” by Tashi Tsering Ghale; “A Continuation of a Vision for Indigenous Governance through the United Nations” by Deanne L. Grant; Ingrid Johanson’s “Australia’s human rights and wrongs”; Rachael Ka’ai-Mahuta’s “The Right to Return: Challenging Existing Understandings of ‘Citizenship’ in Aotearoa/New Zealand”; Tilu Linggi’s “‘Forced’ Prior Informed Consent at the Barrel of a Gun: A Case of Indigenous Peoples in Arunachal Pradesh”; “Our Unique Historical Opportunity: Indigenous-State Relations”, Rachael Grace Patten; Saket Suman Saurabh’s “Rigoberta Menchu and Dayamani Barla: A New Normal in the Hegemonic World”; Vera Solovyeva’s “Ecology activism in the Sakha Republic, Russia’s “Large-numbered” Indigenous Peoples and the United Nations Declaration of the Rights of Indigenous Peoples”; “From Margins to Center: Untranslatability as a Decolonial Practice” by Doro Wiese.